Home / Blog / Himalayan Pink Salt… What’s all the rage? 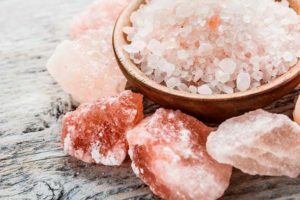 Himalayan Pink Salt… What’s all the rage? The origin of Himalayan pink salt comes from crystallised sea salt beds, that are now deep within the Himalayans, were covered by lava. Aside from being kept in a pristine environment that has been surrounded by snow and ice all year round. The lava is thought to have protected the salt from modern-day pollution. As a result, Himalayan Salt is believed to be the purest form of salt! Himalayan salts have less sodium consumer per serving and has mineral packed crystals which formed naturally within the earth made up of 85.62% sodium chloride. There are 14.38% other trace minerals including; sulphate, magnesium, calcium, potassium, bicarbonate, bromide, borate, strontium. Enjoy a detoxifying Himalayan salt bath. Its nutrients will stimulate your circulation and soothe sore muscles. Himalayan salt contains 80+ nourishing and skin-friendly minerals, so this bath will provide a healing and amazingly therapeutic experience for both body and soul.